Recently, we decided it was about time we had a new model for testing, training and demonstrations. Specifically, we wanted something that would allow us to test the full capability of the standard tacho channels available on the P8000 systems and the optional advanced tacho card. Ideally, we would have obtained a V8 engine or a small turbine, but neither of these are well suited to an office environment! 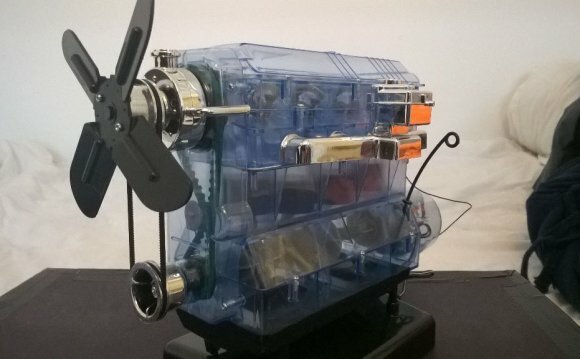 So, we found the next best thing - a model engine. Specifically, a Haynes model of a four-cylinder petrol engine. The model is a fairly detailed reproduction of a real engine with working crank, pistons, valves and cam shaft. This meant that we would have plenty of interesting noise & vibration signals to capture and analyze. The model also offered plenty of scope for easy attachment of a rotary encoder. And, because it's driven by a simple electric motor, we could explore the possibilities of 'overclocking' it to get higher and variable speeds. Look out for more about that in our next post & video.